If there’s one thing the people of Noosa know how to do really well it’s how to have a good time. So it’s no surprise that their annual Jazz Festival has become a highlight on the calendar of Jazz aficionados from around the world. 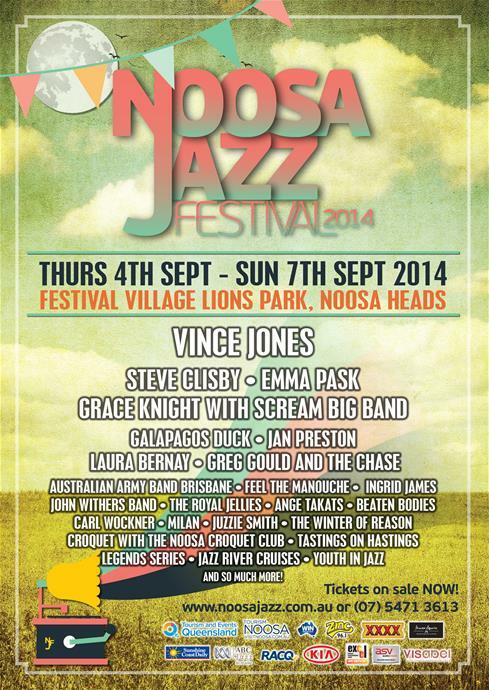 The 2014 festival takes place from Thursday the 4th of September until Sunday the 7th at the Lions Park in Noosa Heads. Once a year organisers, the Noosa Festival Pty Ltd transform an ordinary community park into a world class Festival Village to create what they refer to as a ‘musical picnic’ over 4 days. Picnic has significant relevance as not only can you indulge in some of our country’s leading Jazz, Blues and Folk performers you can treat yourself to a smorgasbord of fine food and wine from a myriad of food stalls that emerge to support the festival’s music lovers. However the foodie in you can take advantage of some very special ‘Tastings’ offers from the restaurateurs along Hastings Street whilst you are in Noosa. The other way to enjoy the Festival’s magic is to take a Jazz River Cruise. Just sit back, sip a drink over some fine food as you cruise the Noosa River. Tickets can be bought separately or as part of your Jazz Pack. See the Noosa Jazz Festival website for prices and details. If there was one voice in Australian jazz more recognized than any other, it would be that of Vince Jones. Our leading vocalist, interpreter, trumpet player and composer has entertained and informed us for decades with his ever-evolving elite group of musicians. Vince Jones’ music includes original songs and beautiful contemporary versions of jazz standards. The Steve Clisby story has been largely unsung, however his has the hallmarks of a life lived in music. The California-born singer played the piano and saxophone from age six and studied singing throughout high school. In the 1970s, he and 17 colleagues took the Hendrix trail to Europe – and there they stayed. Playing every stage in Europe, the group, American Gypsy, eventually made Holland their base and a two-decade career ensued. As a solo artist she transformed herself from Pop Princess to Queen of Cool and lit up the screen in ABC TV’s award winning mini-series, Come In Spinner. A string of successful solo albums followed. During her jazz career, Grace has done countless live shows including performances for five Australian Prime Ministers, President Clinton of the United States, Princess Diana, and the Thai Royal Family. The Noosa Jazz Festival is Noosa’s second longest running event. The annual event has a proud history of bringing the cream of Australian and international jazz talent to Noosa each spring, and 2014 will mark the 23rd anniversary of the festival. The Festival Village at Noosa Lions Park is the heart of the Noosa Jazz Festival and plays host to mainstage concerts, master classes, food and market stalls. The Festival Village is also the location for the departure of the Jazz River Cruises. The Noosa Jazz Festival features more than jazz, it features a diverse program including master classes, talent search, Legends Lunch Series, Jazz River Cruises and the “Tastings on Hastings” events. For the true music lover the Jazz Festival Master classes provide a unique opportunity to learn and gain insights from some of the masters of the music and entertainment industry. In the past patrons have had the opportunity to learn Boogie Woogie piano from Jan Preston, sing a Cappella with The Idea of North group or hear from women in the entertainment industry whilst at the festival. All in all this years festival promises to be as big an event as ever and let’s face it. It’s just another great reason to visit Noosa for the weekend. Enjoy!